All that remains of the original Thomas Edison invention is the socket fitting. That and it still only takes one person to screw in the light bulb. The rest of the ilumi smart bulb, which is slowly lighting the way to smart home and office living around the world, would be unrecognizable to Edison or any of the other early inventors of incandescent bulbs. It is too soon to know whether the names Corey Egan, Swapnil Bora and their company ilumi Solutions will assume a place on the list of lighting pioneers with their smartphone-controlled LED lights. But with a growing list of patents, financing from a certain well-known “Shark” and a steady stream of orders, the David-like startup is holding its own against bulb big shots like GE and Phillips. LED lighting is still costly to produce and package but its expansion in the lighting industry is expected to grow 50 percent through this year, from $5 billion in 2010 to $36 billion, according to the research firm A.T. Kearney. The LED share of lighting market could get as large as 90 percent within the next five years, according to the firm. There are several smart bulbs on the market that can be controlled by an app with Bluetooth technology. Phillips makes a bulb that changes colors with control from an app that contains a separate device that must be plugged into a home’s internet router. 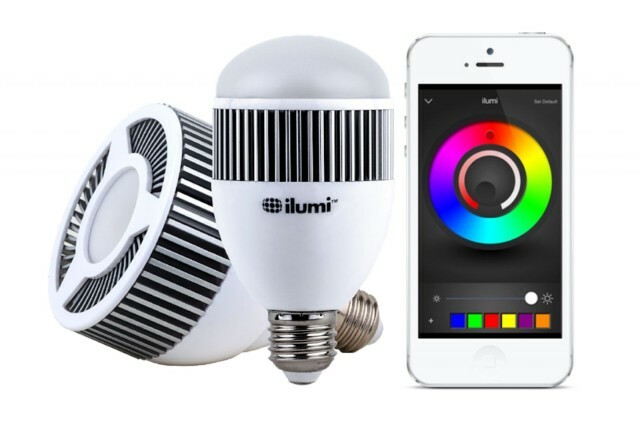 The ilumi bulbs are all controlled from a simple iOS or Android app. Turn on the lights and the app will ask you pair each bulb to a room. 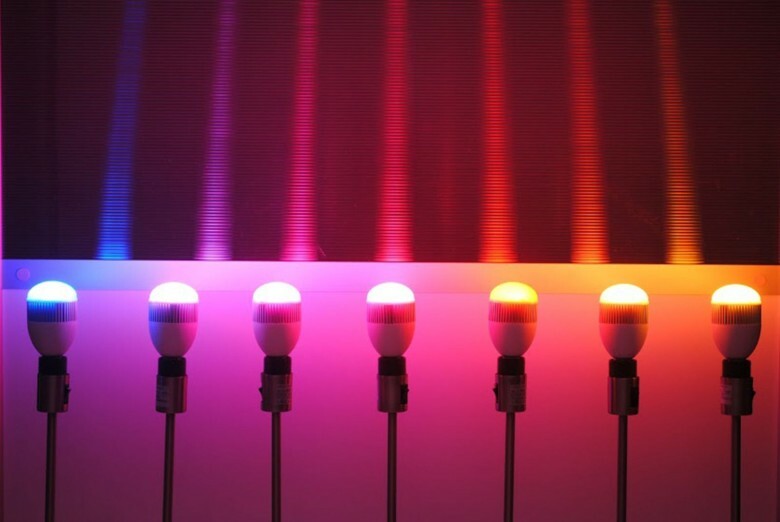 The ilumi bulbs also change colors, which are controlled on the app with a simple color wheel. There are some unique features, like a Torch function, where lights turn on when you enter the room and off when you leave it. Another feature is the Circadian Experience, which replicates in color temperature the sun’s cycle throughout the day. A Rise and Shine mode can be set to wake you like an alarm. You can set and store personalized lighting scenes. The bulb and its colors will also pulse to the beat of music and kids can play a game of Simon. The bulbs use what ilumi calls SmartMesh, low-energy Bluetooth technology that increases the range and number of bulbs controlled by the app. LED lighting lasts longer but is more expensive compared to the old light bulbs. Everyone knows someone who has stockpiled incandescent bulbs as we’ve switched to energy-efficient bulbs. There are two ilumi bulbs, a bedside or table lamp light for $89.98 and a larger bulb for recessed lighting or overhead fixtures for $10 more. Egan and Bora were MBA grad students at the University of Texas in Dallas when they began brainstorming ideas for the school’s annual business idea contest. They knew they wanted to do something in the home environment and there was a convergence of forces – mainly Bluetooth technology and the Energy Independence Act – that pointed them in that direction. The lightbulb went off and they began to work on prototypes. They won several tech competitions, giving them prize money to continue. They also had two different crowd-funding campaigns, one with Indiegogo and the other through Kickstarter, but did not get the needed momentum or capital until an appearance last year on the ABC show Shark Tank. 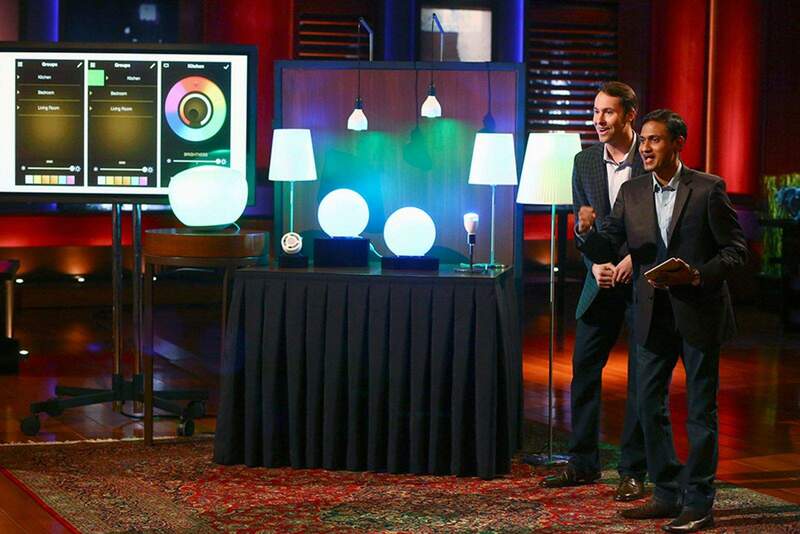 The ilumi concept wooed Mark Cuban into a deal and a month later, ilumi began finally shipping bulbs to early backers. Egan could not say how many bulbs ilumi has sold but said it is in the tens of thousands, from one or two bulbs for homeowners to several for commercial use. The ilumi smart bulbs come in white or black and are available on the company’s website, Amazon, ThinkGeek, ATGStores.com, HomeDepot.com and Fry’s.